I chose this image to create a painting from for several reasons. Deirdre looks beautiful, her expression is relaxed , and the veil adds some nice lines throughout the image. The light is dimensional and creates enough shadows to give the piece depth. The particular area at GCI has some great bones with its large blocks and vertical lines, it gives my background a good sense of weight. I like the effect that suggests that this is an old painting on canvas, you can see the texture burning through from under the paint, in some areas paint seems to have worn off, or has been stained over time. 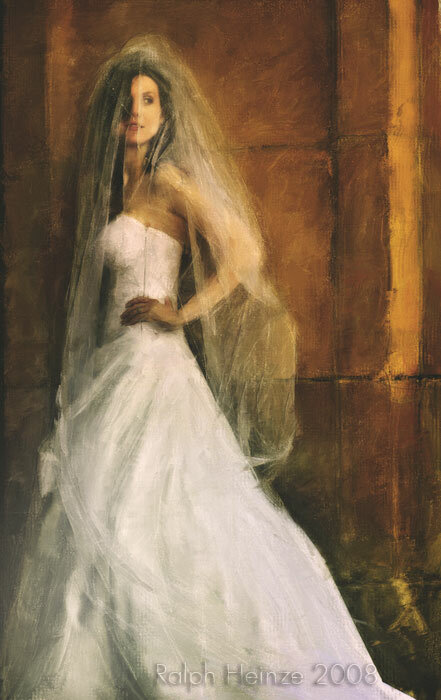 Deirdre’s veil has depth and translucency brought out by the subtle use of chalk to to enhance the highlights. The image was first brought into photoshop and “bent” for tonality, and imperfections removed or cloned out. From there it goes to Corel Painter to add all the brushstrokes to give the piece the semblance of a painting. Then it goes back to photoshop for more tonality tweaking and texturing.